Lecturer and Fiber and Material Studies alum Aram Han Sifuentes (MFA 2013) is currently an artist-in-residence at the Chicago Cultural Center. 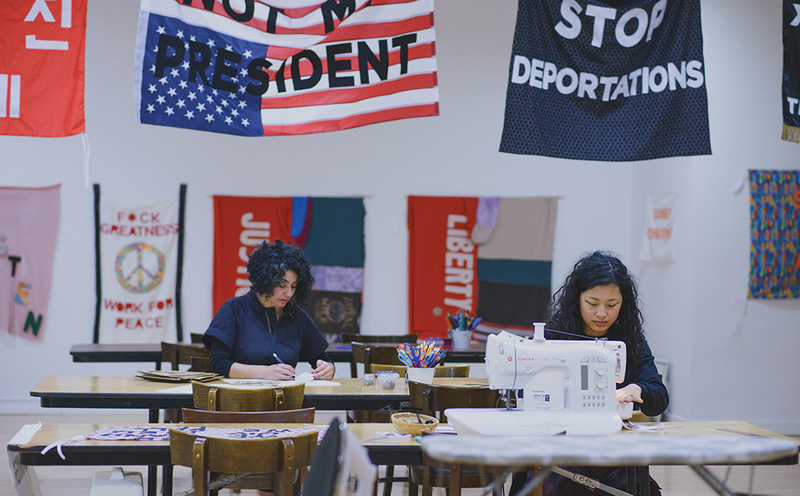 On the first floor in the Garland Gallery, Sifuentes operates a “workspace, workshop”—a studio where she, her daughter and two collaborators invite the public to imagine what their protest banner might look like. She calls the project her Protest Banner Lending Library. Using the space as a site for education and dialogue, participants are invited to channel any frustrations about the current political climate into making banners. Materials and guidance are provided. To learn more about Sifuentes’ project, see Chicago Gallery News’ write-up of it here.